A cancer researcher and Gunditjmara woman, Dr Jenkins took out the STEM Professional Career Achievement Award at the second Indigenous STEM Awards, announced at a ceremony in Wiluna, Western Australia. 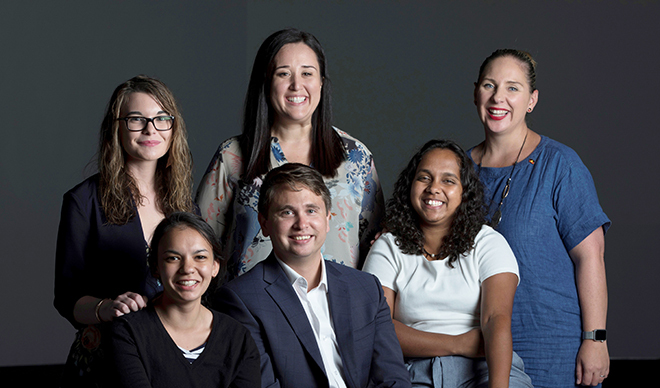 Funded by the BHP Billiton Foundation and delivered by CSIRO, the awards recognise the achievements of Aboriginal and Torres Strait Islander students, teachers and scientists, with a view to inspiring more Aboriginal and Torres Strait Islander student participation in STEM (science, technology, engineering and mathematics) studies and careers. Winners of Indigenous STEM Awards. L-R Back row: Jessica Storrar, Camila Zuniga-Greve, Misty Jenkins. Front row: Kayla Pattel, Dean Foley, Shailyn Isaac. Dr Jenkins and Mr Foley will both receive $20,000 to support their work as Indigenous STEM Education ambassadors in 2018. The school will receive $10,000 to contribute towards progressing inquiry-based learning within the school and incorporating local Indigenous knowledge that can be linked to the curriculum. “Educators Fifi Harris (STEM Champion Award) and Camila Zuniga-Greve (Teacher Award) demonstrate on a daily basis how Aboriginal and Torres Strait Islander students can be effectively engaged in science, technology, engineering and mathematics.